U-177, in common with certain other 1200-ton German U-boats used a small motorless helicopter known as a "Bachstelze" (Water Thrush) for the purpose of observation at a considerable height. The helicopter is demountable, its parts are stored on board, and it is assembled on deck when the Commanding Officer orders an ascent. In flight, it is towed by the U-boat. The following account gained from survivors, illustrated by scale drawings, gives details of pilot training and analysis of advantages and disadvantages of the apparatus. The helicopter is constructed almost entirely of light metal stated by prisoners to be aluminum. The blades of the propeller and empennage or tail parts are constructed of wooden staves with cloth covering and airplane "dope" on the outer surface. The parts of the helicopter are as follows Rotor Head with Blades. Handle for Releasing Rotor and Blades. Strut Wires Parachute Rip-chord Rudder Pedals. Instrument Board. Tow-cable. Control Sticks Pilot’s seat Flexible Cable from Tachometer to Rotor Head.Landing Surfaces Tubular Fuselage Parachute. Fixed Stabilizing Rudder. Moveable Rudder. Rotor Blades. Instrument board with Altimeter, Speedometer, and Tachometer Pitot tube. Fixed Horizontal Stabilizers. The pressure proof containers in which this helicopter is carried on board the U-boat are built into the Conning Tower. The carrier is the vertical pipe which holds the rotor head and the propeller blades. It is about 1-1/2 meters in length. In the upper end is a spindle in which the rotor head is set, though the exact method by which the rotor head is connected to the carrier and the controls have not been established. Within the vertical tube are the cables which are attached to the joy stick, the exact construction of which is also not known to survivors. Just to the rear of the pilot's seat and to the rear of the carrier is an attached parachute, the rip cord of which is attached to the rotor head. THE ROTOR HEAD AND PROPELLER. The rotor consists of a head with insert bosses into which the propeller can be inserted and bolted fast. Since the propeller blades are large in comparison to the rest of the machine, it is necessary that they be supported; therefore, there are cables running from the top point of the head of the middle of each blade of the propeller. Furthermore, there are strut wires running from one blade to the other which give the relatively flimsy propeller assembly some stability. The empennage, like the blades of the propeller, is constructed of wooden ribs, covered with linen, and heavily doped. The leading edge of the horizontal fin is fastened directly onto the fuselage while the trailing edge is held in position with a bolt and, possibly, a spring washer. The horizontal fin is fixed and cannot be controlled. It is approximately700 mm. wide and about 1500 mm. long. The small instrument board or panel contains the following three instruments: (1) Altimeter; (2) Speedometer; (3) Propeller Tachometer. The altimeter is the regular sensitive aneroid type. The speedometer is operated by means of a pitot. The tachometer for the propeller is operated by a flexible cable extending from the rotor spindle through the carrier and the hollow fuselage to the tachometer. The pilot's equipment consists of the following: (1) A combination telephone (transmitter and receiver) built into an aviator's helmet; by means of this, the pilot is in constant communication with his U-boat and can arrange the altitude of his flight by giving orders for the release or retraction of the cable attached to the winch. Also, he can announce immediately the sighting of a ship or any other object he may observe. The steel cable served as the telephone wire. (4) Shoulder straps and belly girdle. In preparing the helicopter for a take-off, at least three men are required in spite of the fact that it weighs only about 132 pounds. Approximately six to eight minutes are required for assembly, depending on the training of the assembling crew. Fuselage and empennage are taken out of the special compartments and fitted together. The pilot must handle the joy stick with great care; he controls the helicopter through "feel", and an experienced pilot can operate it by the noise or "sing" of the propeller. Since the helicopter can weave from side to side about 30 on either side of the U-boat, the pilot can observe the sector astern of the U-boat. In weaving, the pilot must make each movement slowly, precisely. A quick jerk or rapid sideward motion may tip the helicopter and cause it to fall into the sea. When the pilot wishes to land, he must push the joy stick forward, thus tilting the rotor head forward and decreasing propeller revolutions. If this is inadequate, the U-boat must slow down. At the same time, the slackening tow-cable must be hauled in by the winch. As the helicopter is hauled in, certain members of the crew stand ready on deck to grasp it as soon as it comes within reach. This facilitates a safe landing, since movement of the U-boat might otherwise damage the helicopter which itself is bouncing in the air. U-boat helicopter pilots were trained at the glider and helicopter school in Gelnhausen. The school has a landing field about 600-700 meters long and 300 meters wide. This field had a hard foundation, but no special drainage system and was without a runway. The weather at Gelnhausen was not considered ideal for gliding. There was one hangar for gliders. No camouflage was used at Gelnhausen. The school had about fifteen closed fuselage gliders, and three or four open fuselage gliders. There were three old NSFK glider to wing planes. There were only two of the new UBoat helicopterat the school. Range. Survivors stated that the helicopter can attain an altitude of approximately 150 meters, permitting visual observation within a radius of about 25 miles, thus augmenting normal lookout range and the use of surface detection devices. Weather. Only a narrow range of wind and weather conditions is favorable to U-boat helicopter operations. Moreover, as the helicopter cannot be operated at night, use is confined to those areas in which the U-boat may remain surfaced in daylight with relative safety. 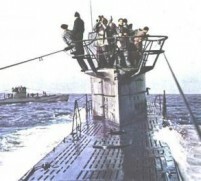 Bachstelze is seen towed by one u-boat. Hovering astern, at a maximum height of 500 feet, this ingenious apparatus would broaden the camp of vision of his lookout. However if an aircraft approached in, the frail kite and his sole occupant would be in danger once the sub had to crash dive in seconds giving no time for plane and occupant to be recovered. Actually the Bachstelze did not contribute to increase the safety of u-boats. Its use was limited to Indian and south Atlantic remote areas where little enemy air activity could be expected. It is extremely important that these compartments remain water-tight since, if sea water were to reach the helicopter, it would be rendered unfit for operation, through damage to instruments and possible warping of the wooden parts. A third pressure proof container houses a winch, to which is attached a 300-meter cable used for towing the helicopter in the air. The fuselage is stored in the portside container, and propeller and tail assembly are stored in the starboard container. Directly above the pilot's head is a release lever. A sharp pull on this lever will release the entire rotor head with propeller attached. As the rotor head falls off, it pulls the rip chord and the parachute opens. It was stated that there is no danger of the propeller hitting the pilot as the helicopter almost always flies with the tail low. As the parachute opens, the helicopter, minus the rotor head and propeller, will sink gently with the pilot to the surface of the water. The pilot must free himself from the helicopter as soon as it hits the water, and utilize his life jacket to remain afloat. There are six of these stabilizing strut wires. The propeller blades consist of wooden ribs about 25-30 cm. wide. Each blade is covered with airplane cloth material, perhaps linen, and heavily doped. The blades are about three meters in length. It will be noted that the tips of the blades are rounded; and the other end is the "attach-on" which is inserted into the rotor head and holds the blade fast. The vertical tail fin has the same construction also, and is firmly attached above the horizontal fin. Attached to this vertical fin is the movable rudder which enables the pilot to control, within limits, the flight of the machine. Through the use of this rudder, it is possible for the helicopter to weave from side to side behind the U-boat, within an arc of about 600. The batteries used for the telephone are contained in a portable box, which also houses a combination telephone set for the use of those on board the U-boat in communicating with the pilot. (2) Binoculars. (3) Clothing. This is determined by the climate; in a cold climate, the pilot wears a leather suit lined with sheepskin and sheepskin aviator's boots; in the tropics, he wears overalls or dark blue fatigues. Once the skids are attached to the bottom, the rotor head and the propeller blades are assembled, and the tow-cable is attached. The winch, with 300 meters of tow cable, is operated by compressed air supplied by the U-boat's compressors. An auxiliary crank and a brake for use in the operation of the winch are also fitted. For the take-off, the U-boat is turned into the wind. The helicopter must be placed firmly on deck. In most instances, the U-boat is stopped for purposes of landing. The disassembling and stowage of the helicopter in the water tight compartments can be accomplished by three trained men in about five minutes. The plane is disassembled in reverse order of assembly, the fuselage being the last member to be placed in the storage compartments. Faulty Communications System. Survivors stated that the telephone cable was short-circuited frequently by soaking with sea water, hampering transmission to the U-boat of orders for operation of the helicopter and sighting reports. Vulnerability Under Attack. If the U-boat is obliged to crash-dive under attack by aircraft, helicopter and pilot must be abandoned. Increase in Personnel. As a high degree of skill is required in the operation of the helicopter specially trained flying personnel must be added to the normal complement of the U-boat.